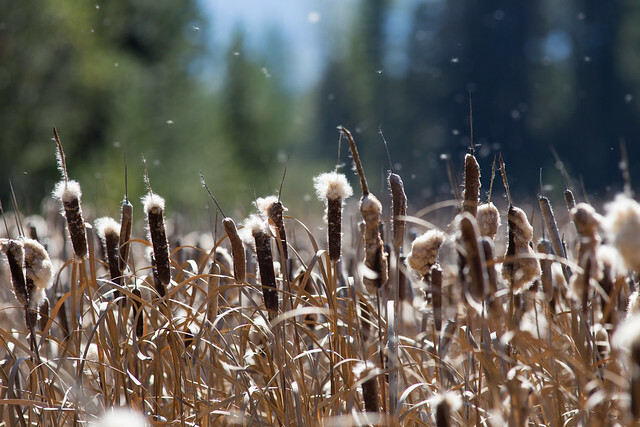 Above: Cattail seeds in the wind, Montana. I’ll be the first to admit that I’ve been in a bit of a creative lull as of late. It’s been about a year since I had a sustained run of creative energy, although I’ve had bursts of it here and there. I know that the creative juices are still there, but for reasons I don’t like to consider I’ve been less able to harness them in a focused way. While I’ve had some energy focused on legitimate projects, a unhealthy portion has been focused on distraction. During an overnight trip to the Sawtooths this summer, I was bluntly and harshly made aware of how distracted I had made myself. After a morning drive up the Payette River, and a somewhat strenuous hike to my camp site, I found myself sitting on the banks of a mountain lake, suddenly without distractions, and it wasn’t pleasant. With no internet, no radio, no trappings of the modern age, no focus on putting one foot in front of the other as I climbed the rocky trail, I was forced to recognize that I had unconsciously let myself drift into a state of perpetual distraction… I had filled every moment with some distractive task to avoid letting my mind wander to painful places. Only when I removed myself from the things that were enabling my distraction did I see how bad it had become. It was an understandable reaction, I see now, as I continue to struggle. The past year has been challenging in a lot of ways, and as spring turned to summer it reached a point where my mind turned to distraction as a survival technique. Just as my summer work season started to wind up, I lost my favorite uncle to cancer. I’d known it was coming for a few months as he fought the long defeat, but that didn’t make it any more bearable. To compound matters I was weaning myself off of antidepressants during those same months, so the loss felt especially keen. My reaction, then, was to compartmentalize the grief, and soldier on at work as the travel demands cranked up, and the work days became longer. For better or worse, likely for worse, my coping mechanism became distracting myself in those idle moments that everyone has. Rather than go through the normal process, I shoved it away, whiling away hours upon hours browsing Facebook, reading photography forums, news feeds, or playing silly smartphone games. It worked, in a fashion, as I put off dealing with the grieving process for most of the year. Above: Halloween sunset over Meridian. As the summer has turned to fall, and fall begins to become winter, I’m trying to rein in the distractions, but not having much luck. 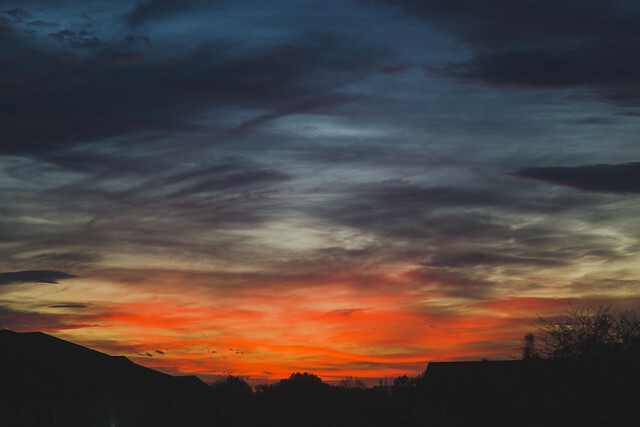 I was starting to make some headway when I was struck with another stressor – my mom was diagnosed with breast cancer just before Thanksgiving. While the outlook is good at the moment, it’s still a jar to the system, and the urge to distract myself from what’s going on around me is strong at a time when I need to be focused in the here and now more than ever. It’s a terrible side effect of modern life, that the same technology that makes it easier for me to stay in touch with loved ones can also empower me to shut out everything around but the mundane and useless, and keep me from living in the moment with those I hold dear. Thus I’ve found myself acting like a rat in a maze to some degree, wasting time running in unless circles, checking the usual spots for small rewards, staring at my devices in most every spare moment, hoping for some excuse to kill time I could, and should, be using to do something worthwhile. Hours I should be spending on some creative pursuit are spent wandering in mental circles, accomplishing nothing. So my challenge this winter is to once again wean myself off of dependence on devices to distract me from what’s important. As we enter this holiday season I resolve to strive once again to be a better person, to live more fully in the present, to face the unpleasant things in life head on, unshirking, focused. And to try to make some time to let my inner creative sasquatch out to play. This entry was posted in Introvert, Personal. Bookmark the permalink.